The SAILOR 6000 GMDSS A3 Complete System Package, including 500W MF/HF, Telex and Mini-C configuration and console, is the ideal solution for IMO SOLAS GMDSS sea area A3 vessels requiring a full, flexible and ultra-powerful GMDSS solution. 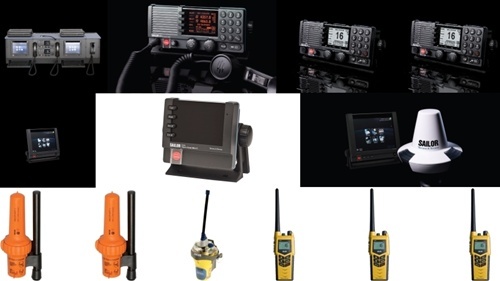 Developed and manufactured by Thrane & Thrane, the market leader in maritime communication solutions, using extensive customer feedback and decades of experience building reliable marine systems. The system 6000 features user-friendly operation, easy and simplified installation and LAN connectivity. The standard supplied goose-neck type console lighting enables operators to illuminate specific areas of the console, standard with white light, optional with red light, as and when required. GMDSS battery status can be monitored from the 6006 Message Terminal and Alarm Panel configurations have been integrated and simplified compared to the previous SAILOR 5000 series. The SAILOR 6000 GMDSS series is a state-of-the-art, powerful, flexible and reliable GMDSS solution for any type of vessel. Full, state-of-the-art new-building/retrofit solution for IMO SOLAS GMDSS area A3 vessels including antennas and cables. Fully IMO compliant, user friendly operation and easy installation with pre-wired, factory assembled console. Dual long-range communication redundancy via one ultra-powerful 500W MF/HF transceiver and one Mini-C system. LAN connectivity and remote support through advanced ThraneLink. Renowned SAILOR reliability and global support network.